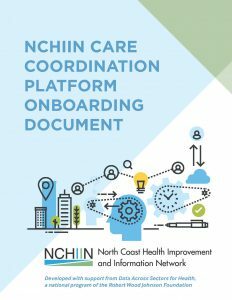 While this document was developed by NCHIIN to be used with partners in Humboldt County, CA, it provides a replicable method for other communities who are interested in developing guidance to onboard new organizations from sectors beyond health care (eg. human/social services, mental health/substance abuse, criminal justice, etc.) into a care coordination system to provide more holistic care for patients, especially those with complex health and social needs. Specifically, this document provides a series of “discovery questions” to explore with potential multi-sector partners relating to organizational structure, data/systems, target populations/programs, and program workflows. It also captures lessons learned and useful techniques NCHIIN developed during multiple iterations of implementation of the care coordination platform with partners.